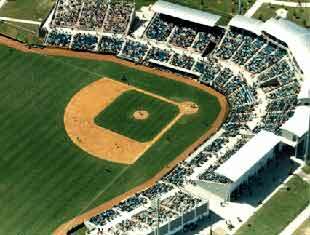 When i visited Space Coast stadium, the Marlins were its current resident, and the Expos trained in Jupiter with the Cardinals. Now, the teams have switched, and the Expos play in Space Coast stadium while the Marlins call Roger Dean home. Space Coast was one of my favorite stadiums. It was extrememly clean, and the stadium was very well kept. The stadium had a reasonably long overhang, which kept fans dry during the lengthy rain delay that took place while I was there. Also, the stadium featured extrememly vibrant colors such as bright blues and teals, a wonderful departure from some of the dull greys that are seen at the older stadiums. My favorite feature of Space Coast stadium was the fact that the players were very generous with autographs. I was able to find a nook that was very close to the field and right next to the home dugout on the first base side. I got at least half the Marlins' autographs there in a span of about 45 minutes. This is a great stadium, and while it has to gimmicky features that cause it to stand out, it is definitely one of Florida's finest. Autograph tip: go down to the home (first base) dugout and on the end closest to home plate there is a nice area with room for about 10 people where all the players walk by to enter the dugout. Also, visit the fields outside the stadium about an hour and a half before game time while the players take BP and you can their signatures as they walk to and from the stadium.